Island of traditions and contrasts, Taiwan attracts the interest of many academics and students throughout the world. The many articles, theses, dissertations, films and projects deserve to be collected and widely diffused. This is what our site intends to do. Enthusiasts, browsers, professionals and all are welcome to discover the research on Taiwan carried out in France and elsewhere. 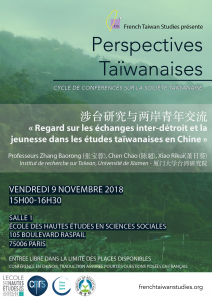 The second conference of the “Taiwanese Perspectives” cycle, dedicated to the sutdy of Taiwanese society, took place on 9 november 2018 from 3pm to 4:30pm in Room 1 of the EHESS (105, bd. Raspail). Zhang Baorong 张宝蓉, Chen Chao 陈超, and Xiao Rikui 萧日葵, scholar at the Research Institute on Taiwan of Xiamen University gave a lecture on the following topic: “Studying cross-strait exchanges and youth in Taiwan Studies in China” (涉台研究与两岸青年交流). Find out more about the story of our project and the team behind it. FTS is centred around a seminar conducted each year at the EHESS. In front of a camera, young Chinese and Taiwanese students share their outlook on cross-strait relations. Directory of archives of academic works on Taiwan.